Here it is October and I’m still trying to catch up on posts of my summer visit to Spain. It’s raining like crazy here in central Texas this weekend so it provides a good opportunity to spend a little time jotting notes here. After San Sebastián, my next stop was back inland. I had targeted wine country and Laguardia is in the heart of that. 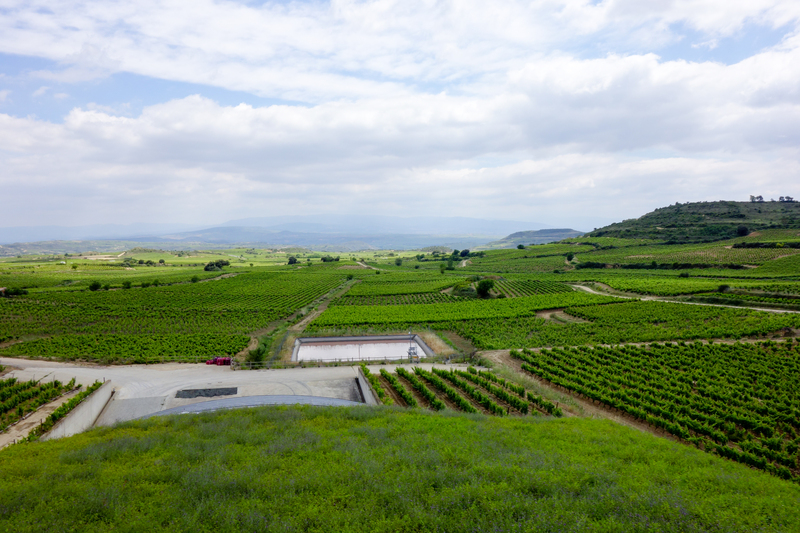 Although strictly speaking it’s in the Basque Country, Laguardia is associated with the Rioja DOC for wines. 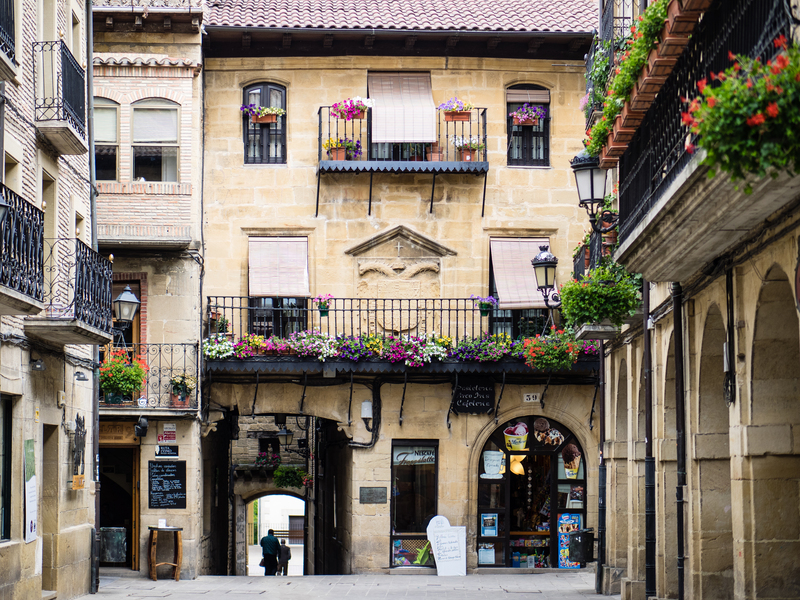 If you’ve had wine from Spain, good chance you’ve had one from somewhere in the Rioja. I hadn’t specifically targeted Laguardia but I’m glad that’s where I landed. I had not done that much research. I knew I was looking for some place interesting to stay in the Rioja and I simply used the map features of TripAdvisor to iterate through places that looked interesting (and reviewed well). 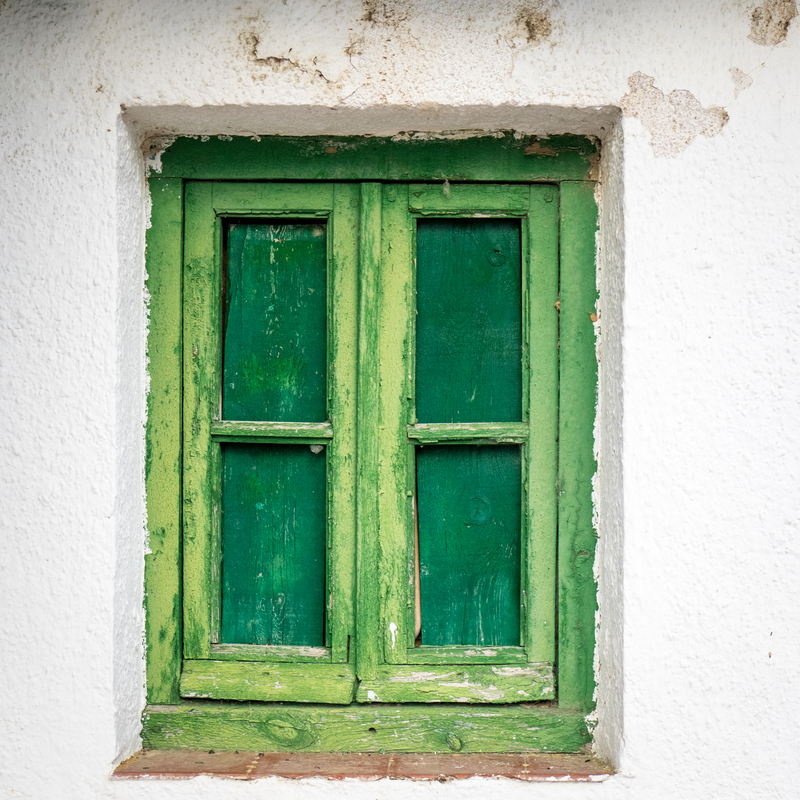 I found a little ‘casa rural‘ called Erletxe. Your guess is as good as mine on how to pronounce that Basque name though I’m sure I was told on arrival. I encourage you to click through to the website. Maria there was such a great hostess. 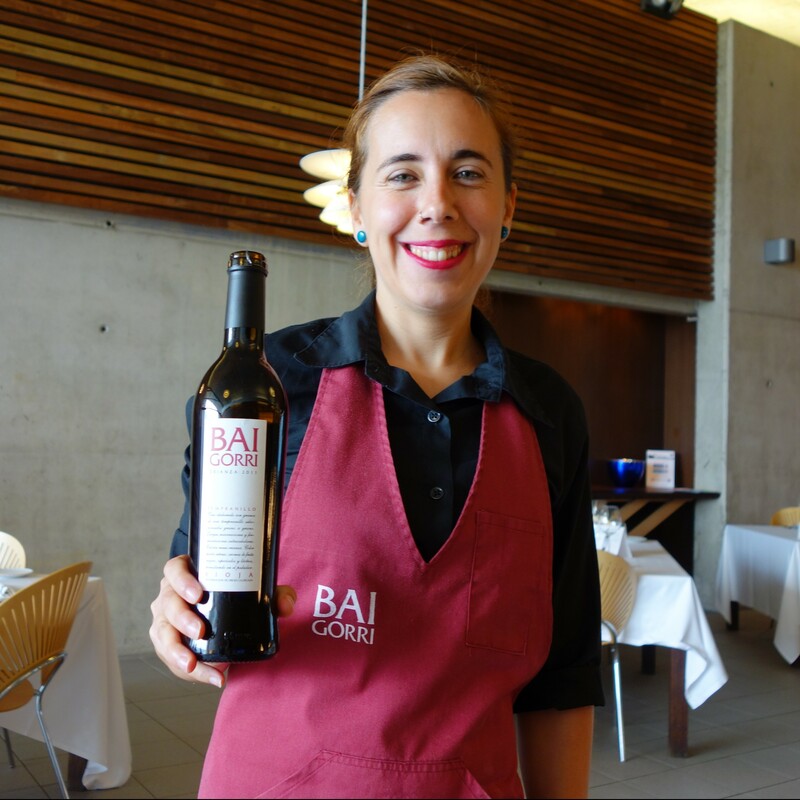 Very friendly and more than that, very helpful in suggesting things to see and wineries to taste in town and in the area. The room was clean and comfortable and breakfasts were great. It was like staying with a family member. Laguardia itself is a very small walled town. You can [leisurely] walk most of it in a few hours or less. While there are some service vehicles that occasionally ply the tiny streets it’s otherwise entirely pedestrian – and thus a quiet place to stroll the streets. 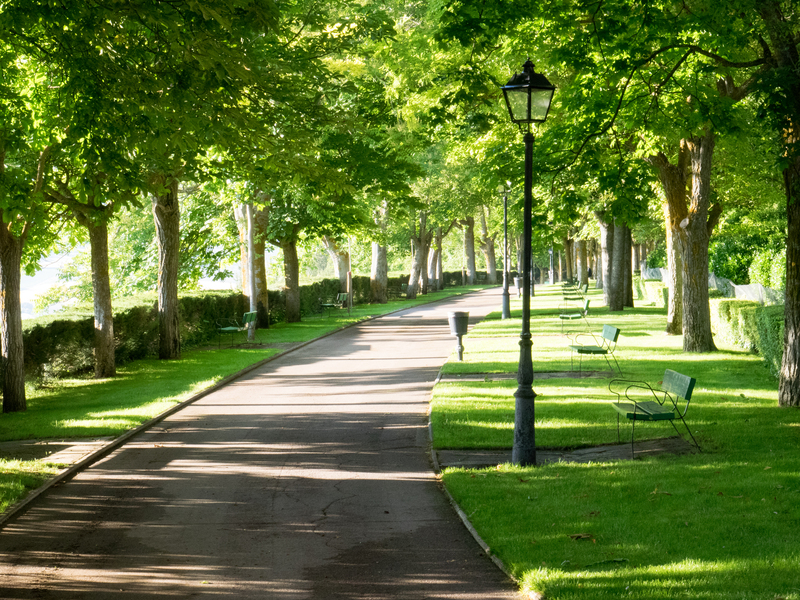 At the north end of the town is a park that rings a good chunk of that portion of town just outside the walls. See photo below. A quiet place just to sit and look out on the surrounding vineyards. 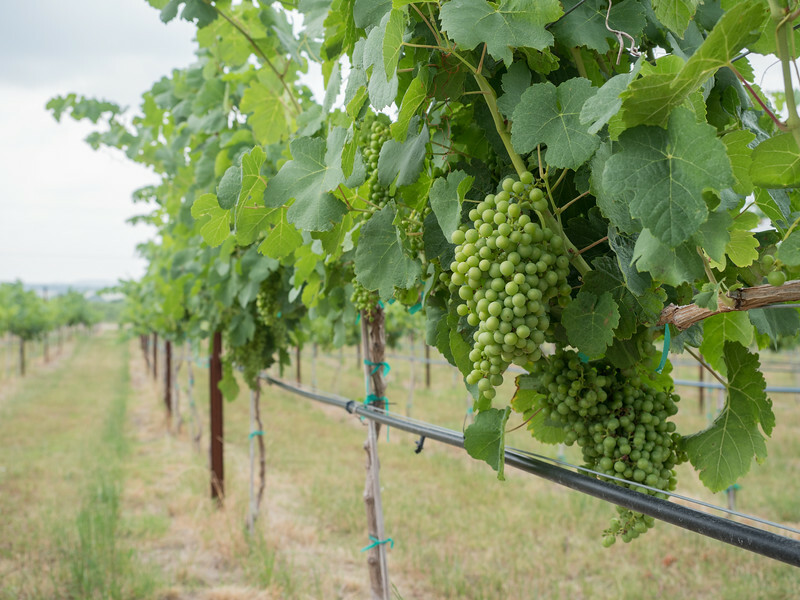 There are a few interesting winery tours and tastings in the town. I visit a couple of note. 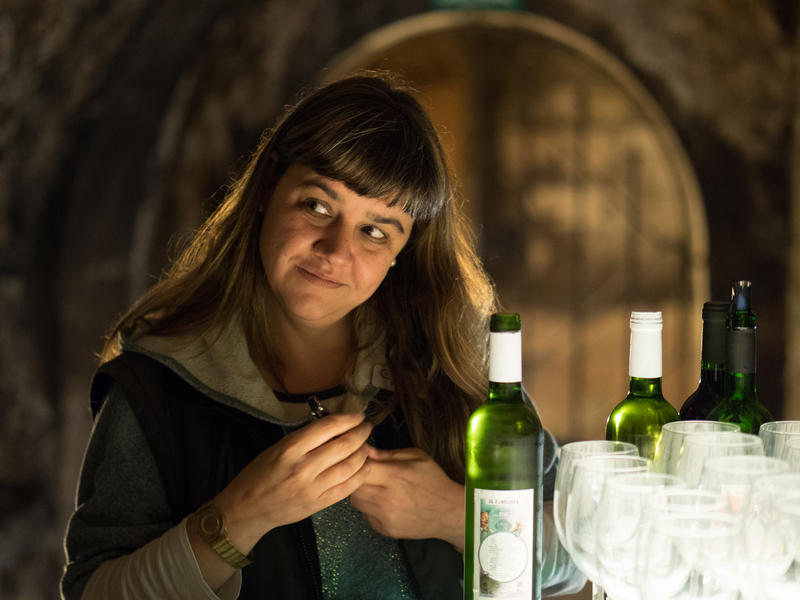 What you quickly understand from these tours is that beneath the buildings and walkable streets of the town it is literally honeycombed with wine cellars. A map of the cellars shows they are under pretty much all of the buildings. Moisture and temperature conditions are uniform and have made for great production and storage over the centuries. 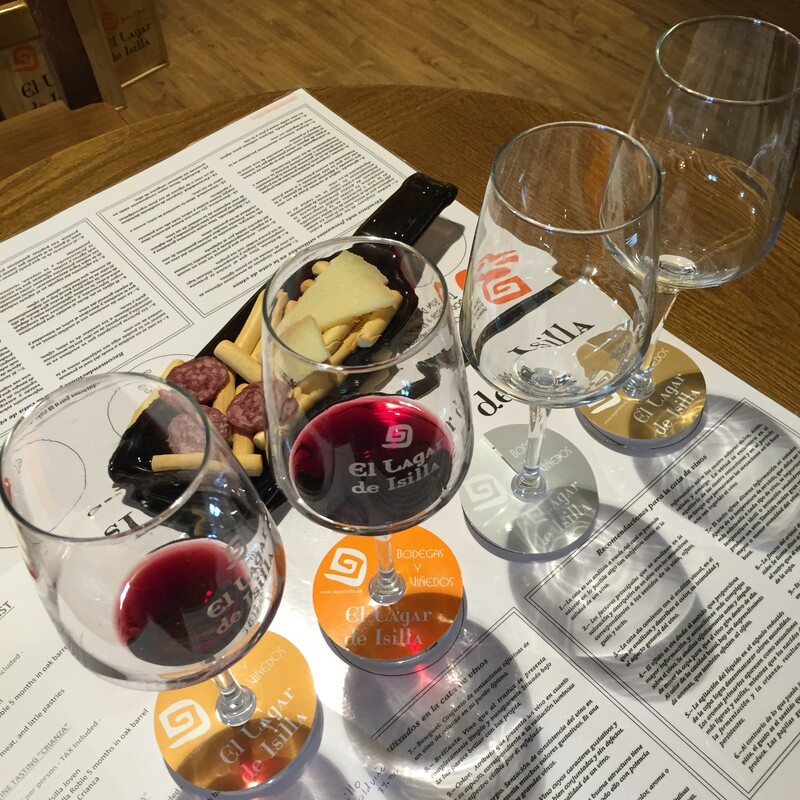 The first I visited was Bodegas Casa Primicia. The tour is excellent as were the wines. The facility has seemingly been only recently renovated and after the tour of the cellar area the upstairs tasting area is thoroughly modern and offers great views of the countryside. 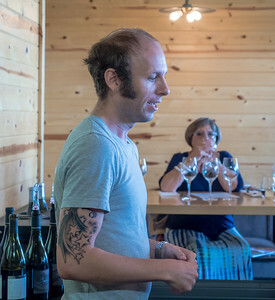 As you can see from the photo here, I enjoyed the Tempranillo here. 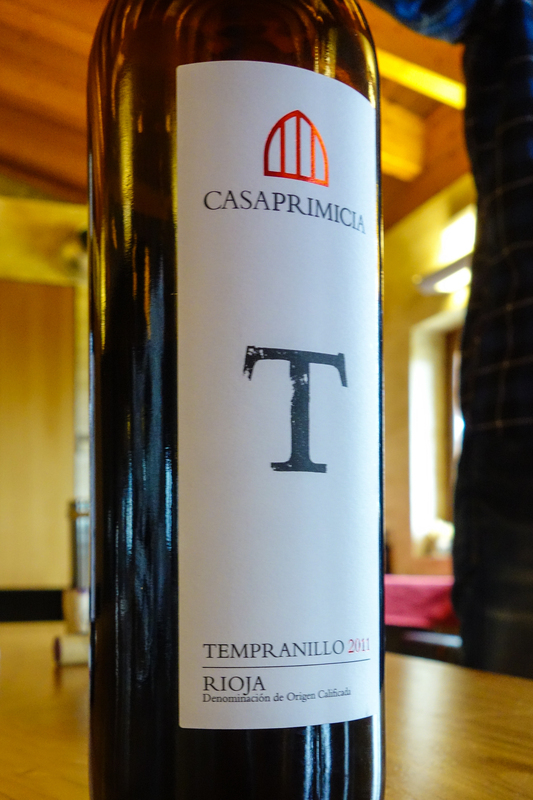 Tempranillo is one of the principal grapes from the region. Also a great tour though not quite as modern a facility was Bodega El Fabuslista. You’ll see from the photo here of our tour/tasting guide that the final tasting was done down in the cellar. The light down there was very interesting and I liked how the photo of our guide turned out. Wines here were good too. As yet a future post will reveal, I was back through Laguardia again after picking up a bike tour. I enjoyed that 2nd visit too and really hope I get the opportunity to visit again. I was returning to Austin from Las Vegas and a work event, and happy to be home. Only one day of what was otherwise a few days conference. Meanwhile, I had an errand to run upon arrival in the south end of Austin later but that meant I had time on my hands for a just bit – and for a change, my flight was on time – and all I’d had earlier in the day was some breakfast around 7 in Las Vegas. So… I was also hungry. Two hour time change and all. 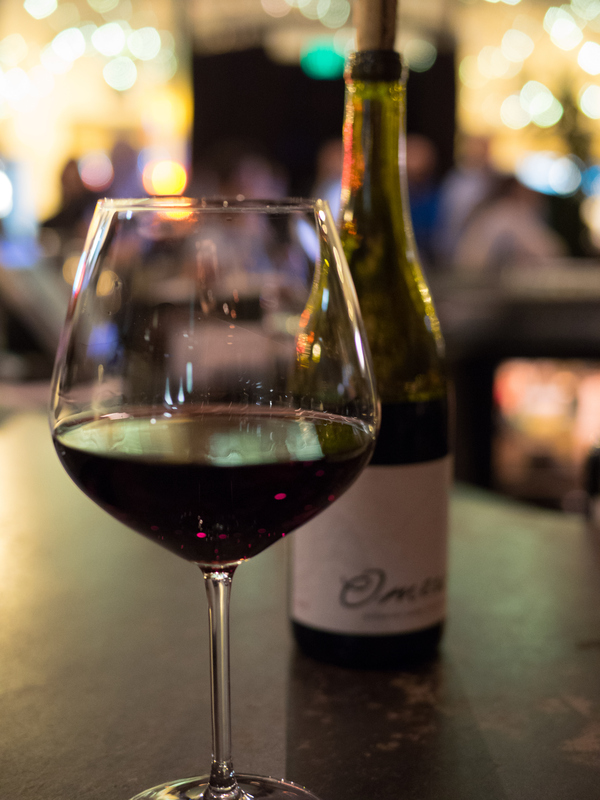 It’s been a [very long] while since I’ve made my way to Winebelly on Oltorf just off south 1st street but for someone returning from the airport it wasn’t far off the beaten path and I’ve been meaning to try the place again. I pulled in around 5 and not surprisingly I had my choice of places to sit. It was a welcome respite from dealing with rush hour. First, the choices by the glass at Winebelly are excellent. I’ll be back to try again. I found Prieto Pricudo by the glass and it’s surprising I found it at all in my opinion. It was a ‘wine find’ during my summer visit to northern Spain this year and I’d never heard of it before that. Snacks at that hour included Truffle Fries… come on… gotta have some of those fries. And I did. 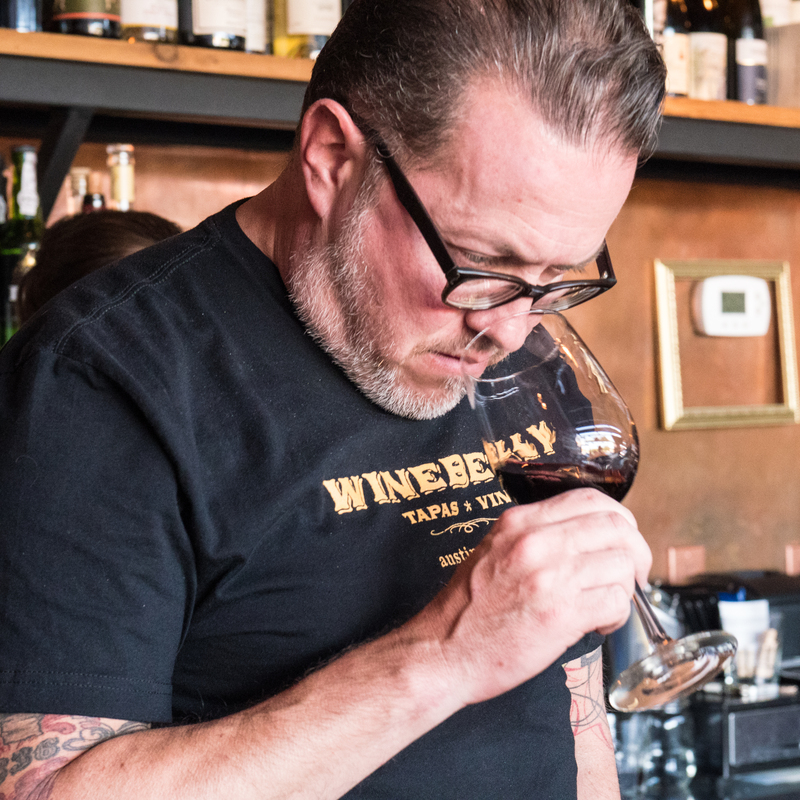 The other pics here are of Ryan Fulmer, General Manager (based only on my reading) about Winebelly. In the course of chatting, Ryan recounted a harrowing story of his son in the military recently in Afghanistan. While I won’t elaborate based on the personal accounting, it was a riveting story and no doubt he’s [still] breathing a sigh of relief that fate worked in his favor. So where do I start? Madrid, that’s where. But I wasn’t there for long. I wanted to check out some of the wine regions of Spain. From Austin I flew to Madrid but immediately got a car at the airport and had made plans to head north. So with the Garmin affixed to the windshield, I headed to the northern parts of Spain and the Ribera del Duero, San Sebastian and La Rioja. But that’s a LONG way to drive after a such a long flight and I knew I’d be tired. Flights to Europe often arrive in the morning and this was no exception but trying to get some solid shuteye in ‘economy’ class rarely pans out very well for me. So I had made plans to find a place to stay along the way. I’m a planner and I rarely leave it to chance where I’ll be staying. 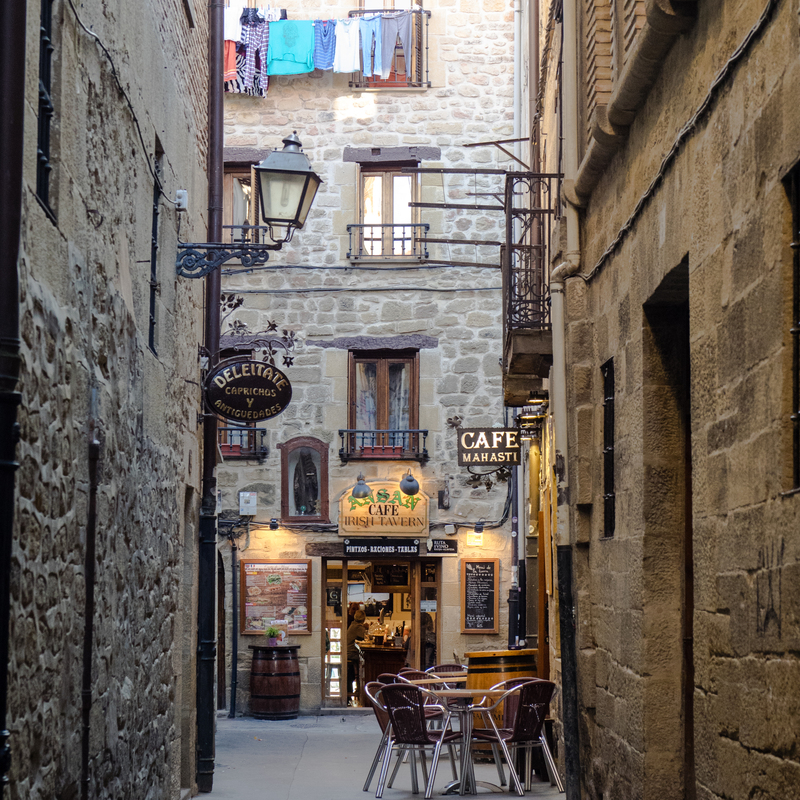 So I had done some searching earlier in the year on TripAdvisor and happened across what turned out to be a great little place to stay in the little town of La Vid, Spain. As a fan of good wine, what else could be better as a first stop than a little inn that’s also a winery with a great little restaurant? The place is called El Lagar de Isilla, and it was a great little waypoint to recharge after the long trip. Aside from El Lagar de Isilla, there isn’t much going on in La Vid. Across from the inn/bodega is the monastery Santa María de La Vid that is pretty interesting to walk around but otherwise obviously pretty quiet. The photo included below is inside the winery part of the inn. There’s a little wine shop and the photo is of the larger tasting room. At the time I was there, I was the only one doing a wine tasting and they held it in the shop. 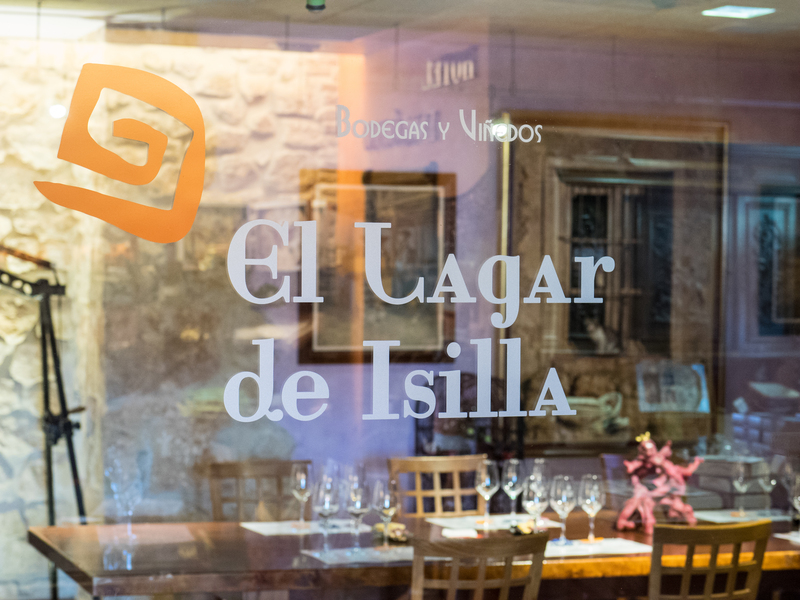 El Lagar de Isilla is in the heart of Ribera del Duero and their wines were excellent. I’d come a long way, so I got their “best” flight. Favorite for me was their Gran Reserva. Dinner and then later the next morning, breakfast, at the hotel were both great. The place is only a couple years old and everything still looked pretty new. If you’re passing through, check the place out. Work-related travel recently took me to Seattle and I always enjoy visiting Seattle – at least downtown Seattle. I don’t know much about the rest of the city. Our office there is downtown and there’s plenty to do within walking distance. So on this occasion I went up a couple days early. As has become somewhat typical of a weekend visit such as this one I didn’t have much of an agenda planned in advance. Like the recent trip to San Francisco, I know Seattle is a very walkable city and so with camera in tow, I mainly planned to just choose a direction and see what I found. Of course I also like to find interesting restaurants so I did actually google around ahead of time and read a few reviews and arrange some places I planned to seek out. Read on for more about them in the ‘Food & Wine’ section below. So where to stay … I didn’t want to stay at the same place I planned to be at for the work-related visit. I wanted to try some place new. In the past I’ve had good luck visiting Seattle on a weekend using Priceline and this was no exception. I picked ‘downtown’ and rolled the dice. Ended up finding The Edgewater. I flew in Friday evening and cabbed it into the city. 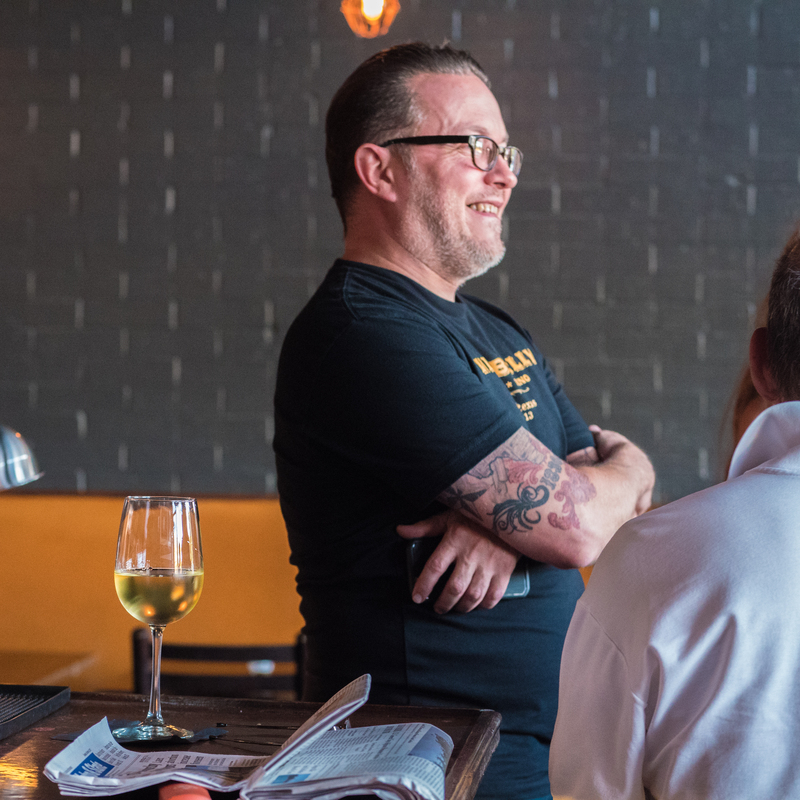 The cabbie gave the Edgewater high praise — particularly the restaurant — but we’ll see. The bar/restaurant at the hotel is called Six Seven and on a Friday evening the place was hopping. So often a hotel bar is a depressing and boring thing that one day had high hopes but ends up being some place a few people sit around and watch the ball game. Six Seven was packed and there was a band playing. 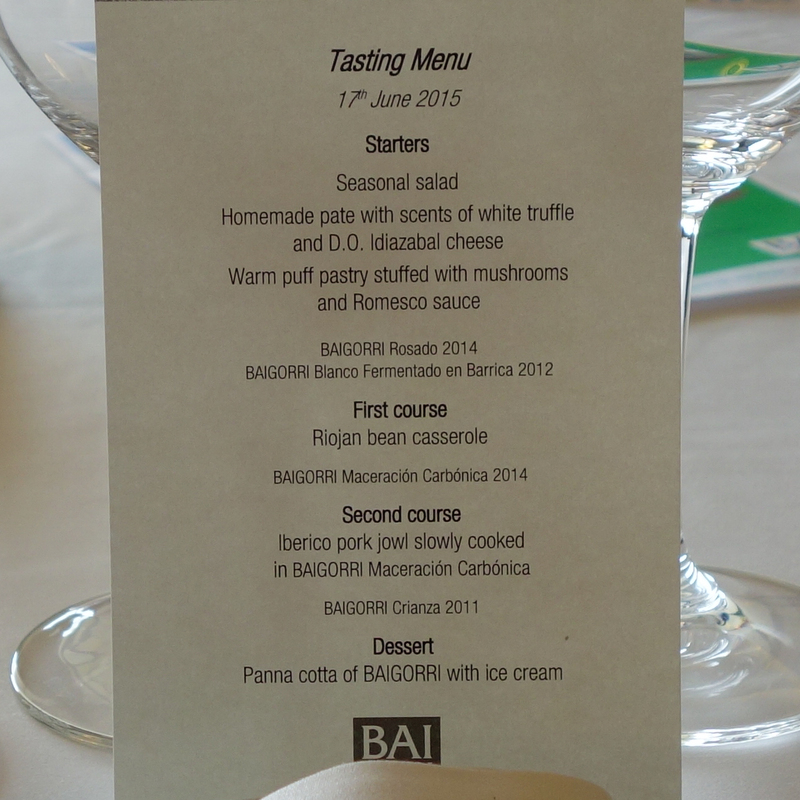 Oh, and they had a good wine list and you could still order some great snacks from the restaurant. I had some lettuce wraps – and they were good. I got a better look at the rest of the hotel the next day. I didn’t hang around long but the lobby is inviting. The place is very lodge-like. You can sit by a big fireplace and since you’re literally right on the water you can watch the ferry boats and ships slowly sail by. Breakfast at the restaurant there was good – though pricey at $20 for eggs, taters, bacon and coffee. It would have been even better had the weather been nicer. While the view of Puget Sound is good even when the windows aren’t open, they clearly all opened to a set of, in this case unoccupied, tables. Maybe someday when the weather is great I’ll make a return visit. Saturday morning there was a steady rain coming down but I had brought clothes and rain jacket for the occasion so no worries. I struck out up Alaskan Way with the idea to ride the ferry boat over to Bainbridge Island. No particular destination in mind over there. In some ways it was just an excuse to get out on the water and see things from a different point of view. On a Saturday morning the ferry leaves fairly often so it didn’t take long before the next one came along. Round trip: $8 for a pedestrian. It takes about 35 minutes to make the trip over. The little town on the other side is very walkable and if you like to window shop for an hour or two it’s an interesting visit. I grabbed a sandwich mid day at the Hitchcock Deli and then later after walking around some more and a leisurely coffee at Pegasus Coffee I headed back to the ferry. But first, along the way I found Classic Cycle. 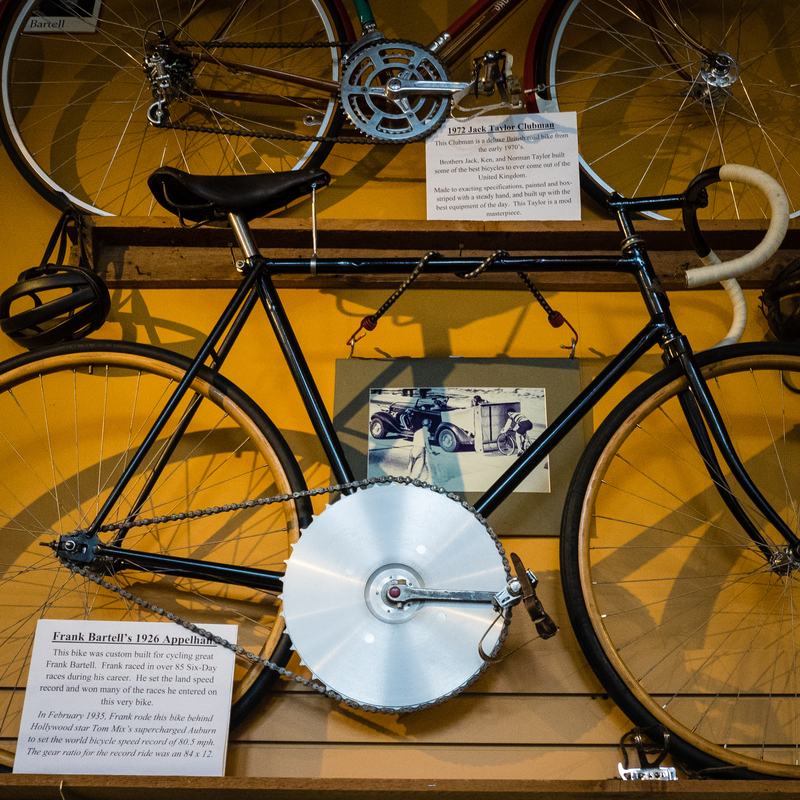 It’s a very cool bike shop that has a lot of vintage bikes hanging on the wall. You can see one of them in the photos I’ve posted here. That bike is said to have gone 80mph. The ferry ride back was uneventful. In fact, I napped most of it. Surprising considering I’d loaded up on coffee before making the return trip. Most of the rest of Saturday afternoon was spent poking around the Pike Place Market. The place is always buzzing with people and interesting sights. That day was no exception. A heavy rain for part of the afternoon meant it was even more jammed. 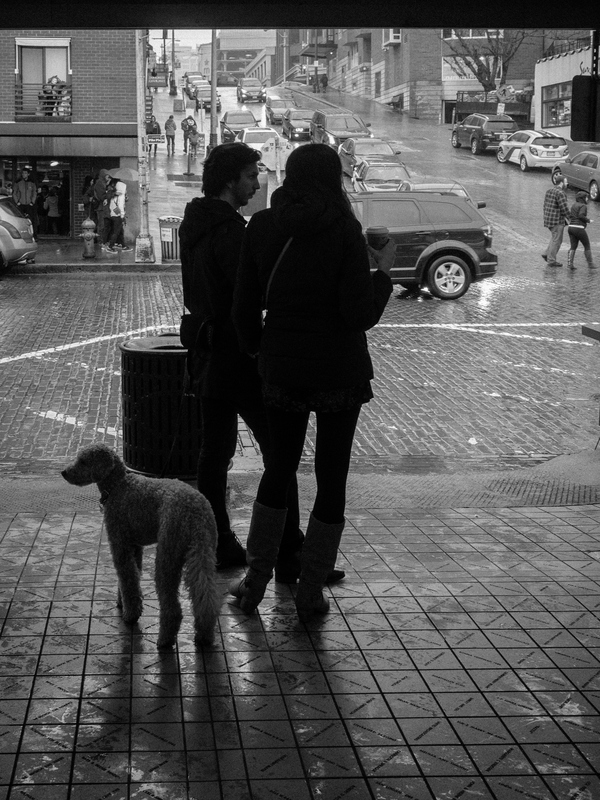 The b&w photo posted here of the couple with the dog was one I snapped when miraculously the throng of people parted and they were there alone. They were just waiting out the rain it seemed. Skipping to Sunday, I stuck close to the downtown area. I walked out to Seattle Center. It’s not hard to find. Just locate the Space Needle and it’s all of the area and buildings around and near the base of the needle. The primary draw for me was a visit to the Chihuly Garden and Glass. 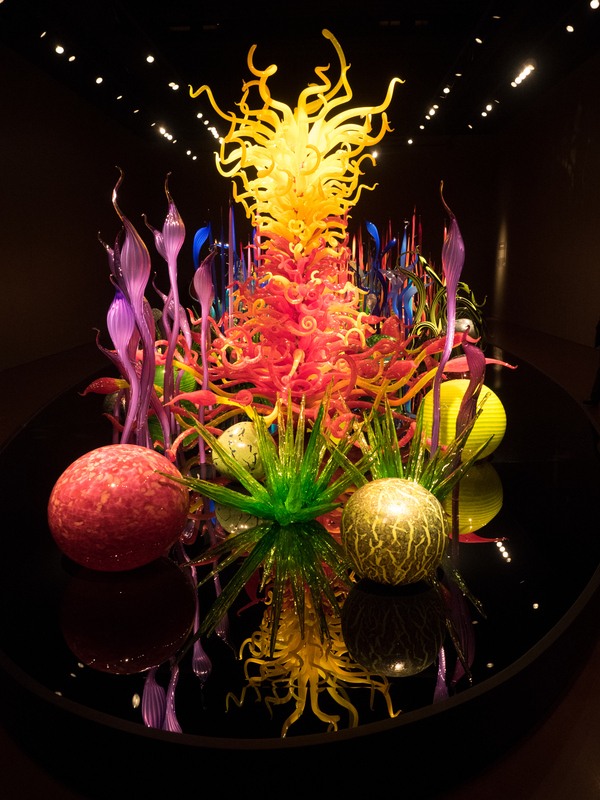 It’s an amazing exhibit of glasswork done by Dale Chihuly. You can see a photo of one of the room sized pieces posted here. Even at the $20 ticket price, if you enjoy art glass it’s worth a visit. Matt’s In The Market is a place I’ve visited once but it was many years ago. Since then I’ve tried to drop in on other visits but it’s a small and very popular place so my advice is to get a reservation. Even though I was traveling solo I got one this time and I’m glad I did. I ended up with a table with a great location that overlooked the Market. I snagged the photo posted here at right from the window by my table. Despite the touristy location the food is excellent. I had a salad to start but for the main had the ‘bacon wrapped rabbit’. Very tasty. It came with spiced red cabbage, lentils, carrots, parsnips, mustard seed, and some “rabbit jus”. 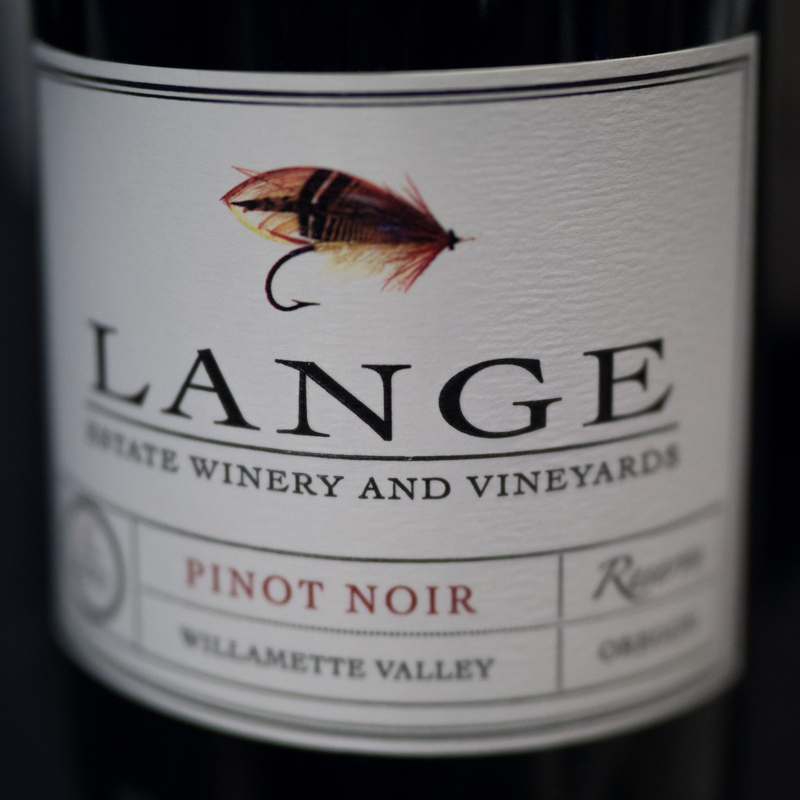 And to enjoy with, they had a favorite Oregon Pinot Noir by the class from Stoller. As someone doing the town on foot, at 10th Ave, Lark is a bit of a hike. But not that bad. First, I have to say I enjoyed the wine menu. 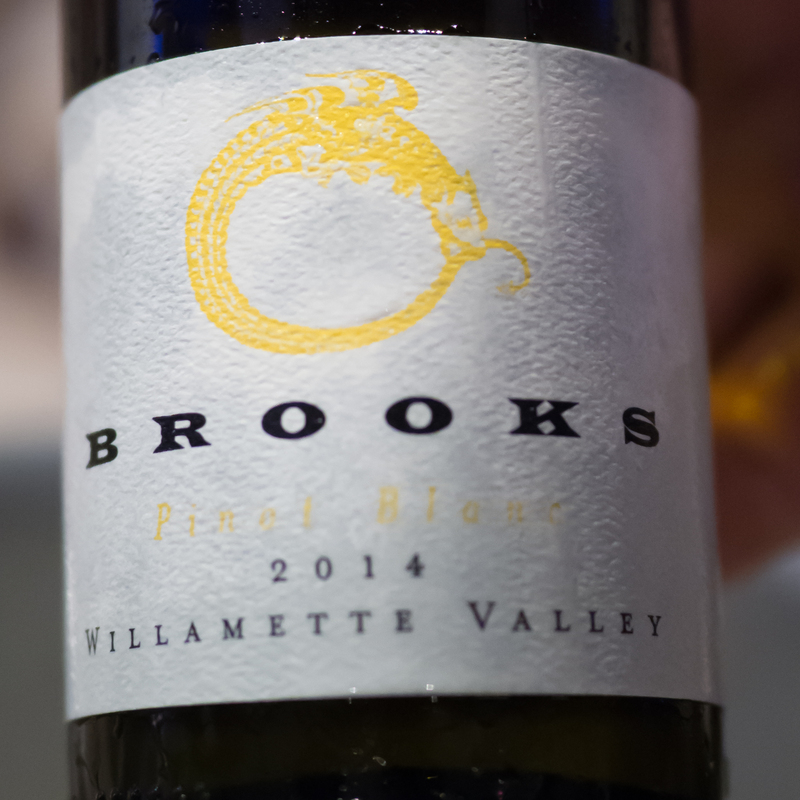 As a fan of Italian wines and a recent visit, I was happy to find selections from Piedmont. I started with a glass of Roero Arneis. Then moved on to Langhe Nebbiolo. Meanwhile, they also have some great cheese selections here. I stuck with the Italian choices. A Tuscan Pecorino and a 2nd from Piedmont. While out on Bainbridge Island, I wandered the shops and one was a wine shop. I didn’t buy anything but I chatted up the guy working there and I asked him what wine bar should I visit in Seattle. His immediate reply was Purple. So, I pulled in for a visit. The place is huge. Gymnasium sized, with a circular tower of a wine rack in the middle of it. The draw of this place in my opinion were the wines by the glass. Huge selection. And wine flights too. 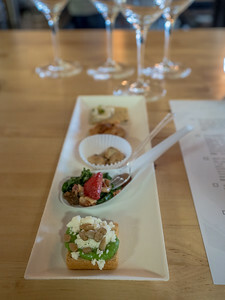 I had an Italian White wine flight, followed by their “Tour de France” selection of 3 great French reds. 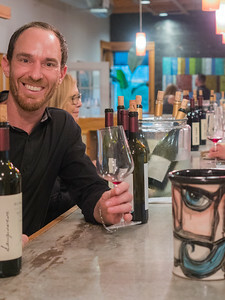 The photo posted above of the solo glass of wine was taken at Purple. 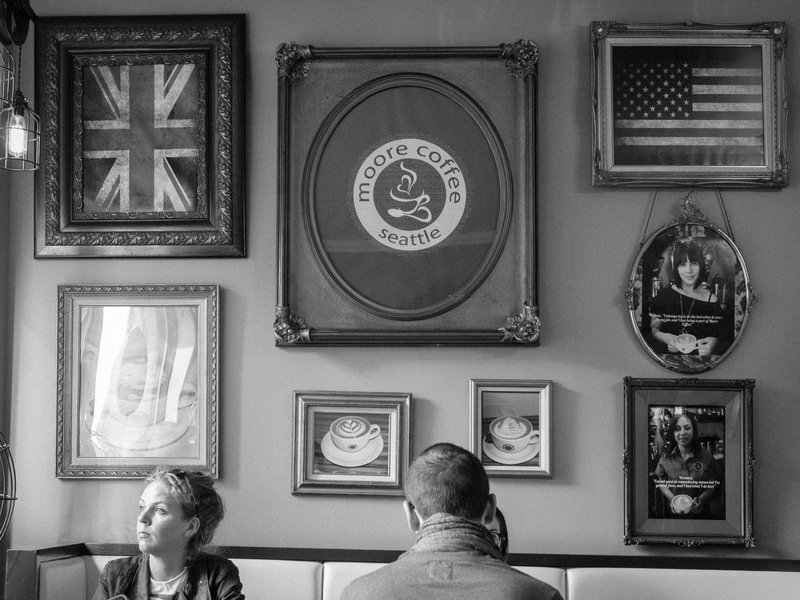 Last but not least, what visit to Seattle would be complete without some great coffee. I’ve tried many places there but I still really love the coffee at Moore’s Coffeeshop. This is coffee artistry. Both in taste and in the latte art they manage to pour into your cup. The place is really tiny but they also have some seating these days so it’s not just a ‘to-go’ place. I parked there for a bit and snagged this photo of the wall and my fellow patrons.